Sometimes it is not the beauty but the rawness and poignancy that wins. Such is the case of the 2017 Wildlife Photographer of the Year Award. This year's winning image was taken by a photojournalist Brent Stirton. 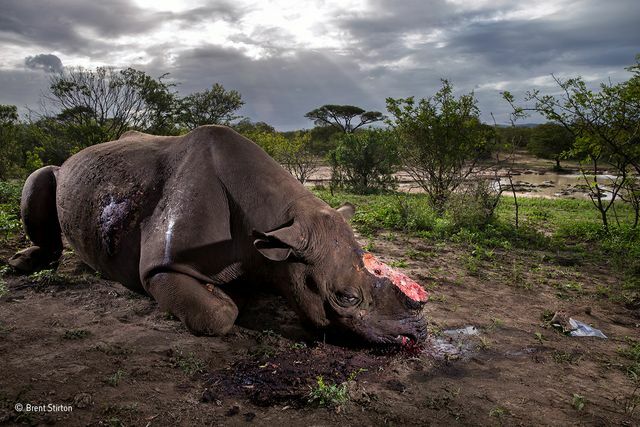 His heartbreaking photo, entitled Memorial to a species, shows a recently shot and de-horned black rhino in South Africa’s Hluhluwe Imfolozi Game Reserve. What's more horrific, Mr Stirton allegedly visited over thirty similar crime scenes while covering this tragic story. Black rhinos are now a critically endangered species, mostly thanks to poaching and the illegal trade in their horns. There are thought to be only around 5,000 left in the world. Rhino horn is very highly valued in China and Vietnam as it is considered as a miraculous cure for many illnesses. The winning photo is beautifully shot yet, most of all, it is disturbing and it will hopefully get people talking about the issue again. The exhibition opens at the Natural History Museum in London on 20 October 2017 and it will touring across the UK and worldwide thereafter.